cryptonaut-in-exile: Did I miss the memo? 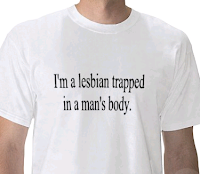 Am I (an American male) supposed to be blogging as a lesbian? Did I miss the memo? Am I (an American male) supposed to be blogging as a lesbian? Relevant (?) urban dictionary entry.